If we are ever out shopping together and I pick up a green sweater with the intention of buying it, take it out of my hands and hide it from me. That or ask me which of the TEN GREEN SWEATERS I own I'm going to give up to make room for this new addition to my wardrobe. 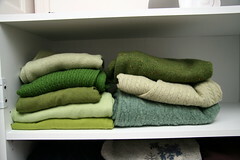 Perhaps before all my sweaters were neatly organized in one set of shelves, I didn't notice how my green sweaters were multiplying in the corner of the bedroom. But really, I'm starting to look like a stand in for the Jolly Green Giant. Oh, and I also spilled green wax on my fingers this evening, so I'm typing this (touch typing, even) with only one hand. There's no permanent damage and really it's my pride that's bruised more than anything, but I think I'll ask Rich nicely if he'll figure out how to get the wax off our wooden counter while I lick my wounds.